Your brain, plus powerful magnets, plus math, equals your potential videogame success. Researchers at the University of Illinois say that they can accurately predict whether a person will be good or bad at videogames by looking at scans of their brain. The researchers were investigating the idea that some people who had more natural ability in certain complex tasks would have subtly different brain structures than others. The study called for subjects with very little experience playing video games. 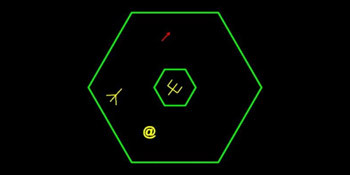 These subjects underwent an MRI scan before playing a videogame called Space Fortress - pictured above - which had been developed at the University. By comparing scans with the scores from the game, and particularly the images of the nucleus accumbens and putamen, the researchers found that they could predict how well the majority of subjects would perform in the game. In a statement released earlier in the week, the team said its predictions were correct between 55 and 68 percent of the time, a degree of accuracy it said was "unprecedented." "Our data suggest that some persistent physiological and or neuroanatomical difference is actually the predictor of learning," said University of Illinois psychology professor and research leader Art Kramer in the statement. "We find variations among participants in the patterns of brain activity in their basal ganglia," added Dirk Bernhardt-Walther, an Ohio State University psychology professor who spearheaded the experiment's design. "Powerful statistical algorithms allow us to connect these patterns to individual learning success." The team will soon publish the full details of the study in the science journal PLoS One.